Brilliant idea. Love to see this when it's done. I am, however, a bit baffled about the adjoining box ends. 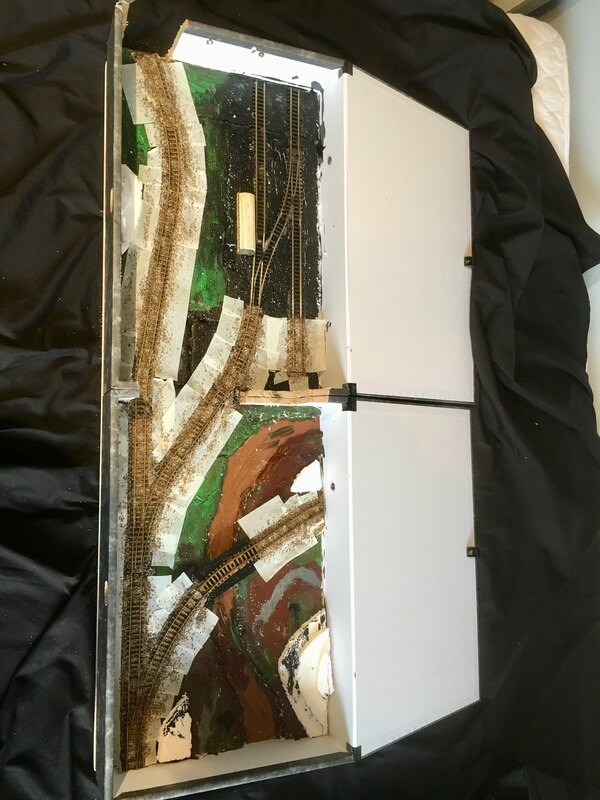 Will you just cut a hole for the trains to pass through and, if so, how will you disguise it? There isn't a convenient overbridge in the area that I can think of. 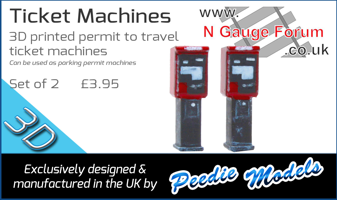 Could you cut them off completely and fabricate removeable ends to slot in when they are separated? Perhaps you could do the same with the fronts as well so the layout can be viewed from the front? Looks like a very good plan Martin. I’m with Chris regarding the join between the two box files, intrigued to see what you do. I assume that removing them comprises box structural integrity, or is the whole idea two separate self contained and fold up box files? I knew there was a snag! So.....this afternoon I dealt with the box ends. Despite being cardboard they proved to be incredibly stubborn (even to a very sharp razor saw). Anyway, no pictures today as there is little to see really. I’ll wait till I’ve done a bit more work. Just seen this. A great idea, looking forward to seeing mature. A little more work today. The two boxes are now fixed to a sheet of plyboard and as you can see, I’ve made the cuts to accommodate the track. Track laid and glued (with copydex) into place. The track up the left edge is the line from Wadebridge (off scene at the bottom) to Trepol Bay. The line off to the right over the river is to Cant Cove and Penmayne. The sidings to the right of the grounded van body are a representation of Wadebridge depot. I’ve added some polystyrene “lumps” to add a bit of height here and there and when they are stuck fast, I’ll give them a skimming with tile grout. Tomorrow, I hope to paint the sleepers and track to weather it. I’d normally spray it but don’t want to do that it such a confined space. Painting will take a little longer but will look fine when done. Then it’s on to ballasting. Hopefully it’s making some sense so far. Anr remember, fotget the garish colours - that’s only the base and won’t be visible when finished. I seem to have lost the 'thank you' icon. Is it just me or is this a more global conspiracy to undermine the NGF? You should see a whole row of icons (thumbs up/down etc) below the post you want to give thanks to. Just click on whichever icon you choose. I wondered what they were for! All taped up. Ballast roughly spread. Ready for tidying with a soft brush after lunch then add the dreaded glue. It's great to see how much can be done in that limited space. One word of criticism, though: I feel that your output is much too high. 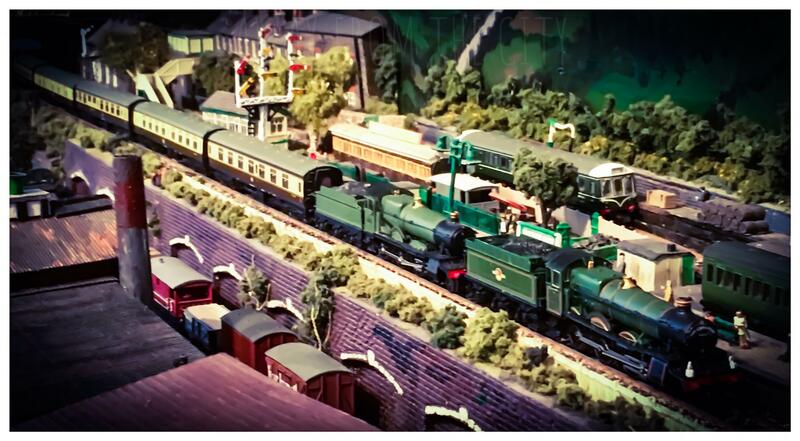 How can it be that you build three or four layouts in les time than I need to get one done? Keep up the great work, Martin. I’m still, very much at the messy stage. 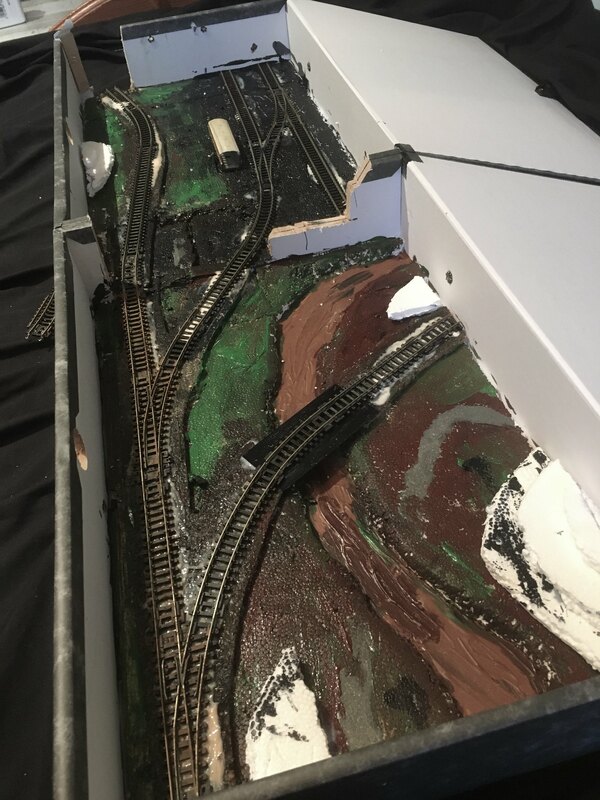 Ballasting nearly finished but some tidying and infilling to complete. 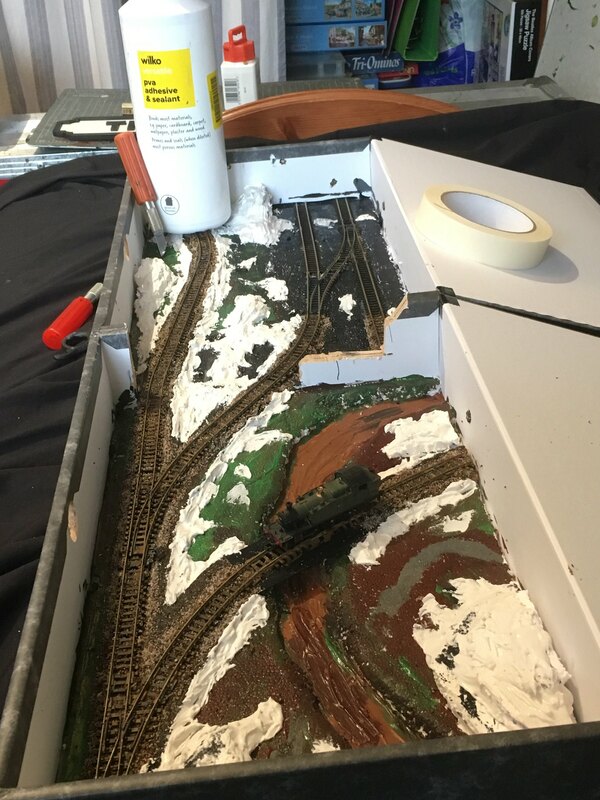 I’ve also plastered over the little polystyrene mounds (this reduces the overall flat appearance) and banked up the track edges where it was mounted on cork strips to give it slight elevation above the river floodplain. The track top right is the depot area hence not ballasted. This will be largely compounded soot and clinker. The 45xx crossing the river (heading bunker first towards Cant Cove) gives an idea of scale hopefully. I now have to wait for the plaster mounds to dry before they get a covering of paint which will give a better picture as to what the whole little scene will look like. The PVA is, of course, acting as a weight to hold down the end bit of track. This is the bit which will connect to the spur from the Trepol Bay fiddle yard. 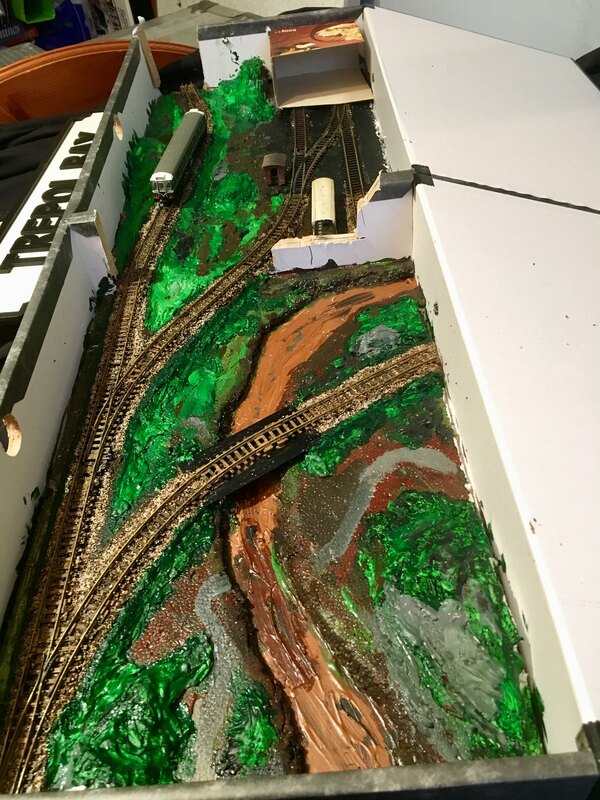 Today I’ve given the rest of the scenery its base coat of paint (the garish colours won’t show in the long run) plus I’ve tidied up the ballast edging although it’s not complete yet. The cereal box indicates the proposed position of the loco depot which will be half relief lengthwise if that makes sense. I’ll be incorporating the unusual coaling stage that existed at Wadebridge depot plus the rather substantial loco hoist and a small old carriage which was used as a messroom and for holding the well knownMutual Improvement Classes. In addition I’ll be adding a signal box between the two junctions and, of course, a bridge structure over the river. The bubble car is on its way to Trepol Bay.